Join us at the 2019 WSNA Biennial WSNA Convention! There are a few spots left for sponsorship of attendance. Don’t miss WSNA’s biennial convention being held May 1-3 at Tulalip resort. Nurses from across the state will convene to get an update on the national and state labor scenes, to learn how to be more effective leaders in our own workplaces, to celebrate our successes and to strategize for what’s coming next. Our WSNA Southwest Local Unit Officers are sponsoring 4 nurses who are WSNA members with registration and reimbursement of hotel costs and mileage reimbursement. Don’t miss this exciting opportunity! and then RSVP to WSNA Nurse Rep Mara Kieval at mkieval@wsna.org. Labor neighbor door knock - tomorrow, Oct. 20! Ballots are arriving in mailboxes this weekend, can you join us? Phone banking will be held every Tuesday (except election night, stay tuned for more on Election Day activities) from 4:30 to 8 p..m at the IAFF Hall Local 452 (2807 NW Fruit Valley Rd Vancouver, WA 98660). We are calling union sisters and brothers for our labor-backed legislative candidates as well as Carolyn Long for Congress. If calling from home is a better option, I can send instructions. This upcoming Tuesday, plans will be slightly different. Carolyn Long will be having a GOTV rally and canvass at IAFF Hall at 4 p.m., Tues. Oct. 23! We hope to have sisters and brothers attend. If you want to phone bank instead of canvass, we can arrange that. Please note that we will be switching this upcoming week's phone bank date to Wednesday, Oct. 24 from 4:30 to 8 p.m. Stop by if you can! Questions? Contact me, WSNA Nurse Representative Mara Kieval, at mkieval@wsna.org. There is nothing more important than the safety of our patients and our members. Please complete the safety survey by Oct. 31. 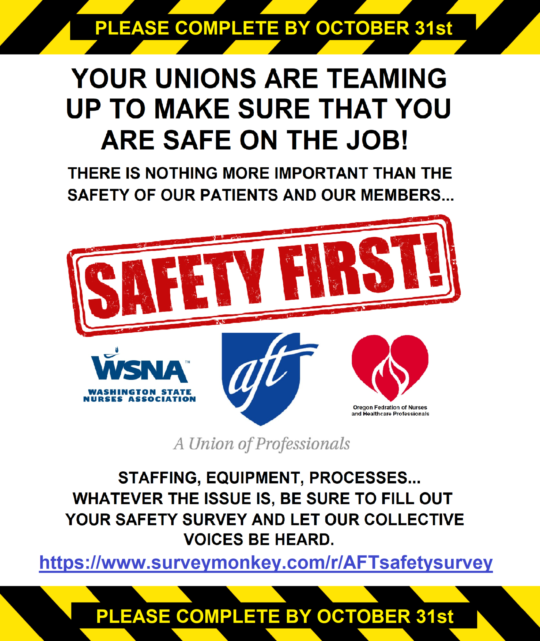 Staffing, equipment, processes – whatever the issue is, be sure to fill out your safety survey and let our collective voices be heard. Your new contract was ratified! Thank you all for coming in to vote on the new contract. We hope to have the final copies online in the next few weeks, but most likely it may be after the holidays. We believe retro pay will be paid out on your Dec. 29 check, although payroll hasn’t yet confirmed if that can be accomplished. We want to thank the nurses who generously donated their PTO to help offset the loss of income for taking time off to negotiate the contract. We are sincerely touched by your donations. Thank you! Your negotiation team is thrilled to report that after an incredible turnout of nurses at the ratification vote on July 6th, nurses voted overwhelmingly “YES” on the new contract! New provisions of the contract are effective today. However, the retro-active pay will take payroll a few weeks to process. Thank you all for voting and showing support for the team. At the vote, nurses were given forms to donate some of their PTO hours to the team members who volunteered over 100 hours of their own unpaid time to gain a terrific contract for every RN in the bargaining unit. If you would like to donate PTO hours (even an hour would be appreciated), please print the form and fax to Theresa Colletto & Mara Kieval by 7/21/17. Thank you for your consideration. We will be holding a vote on the newly negotiated contract on July 6th. Please find one of the times below to drop in to view the redline of the contract and to cast your vote for the new contract. Negotiating team members, your nurse representative and attorney will be available to answer your questions. Only current WSNA members are eligible to vote on the contract. And more good news to come…. We are working on finding a date to hold the ratification vote which we hope to hold in the next 2-3 weeks. We will send out an additional communication when the date, times and a location is scheduled. Your negotiation team unanimously encourages you to vote YES!